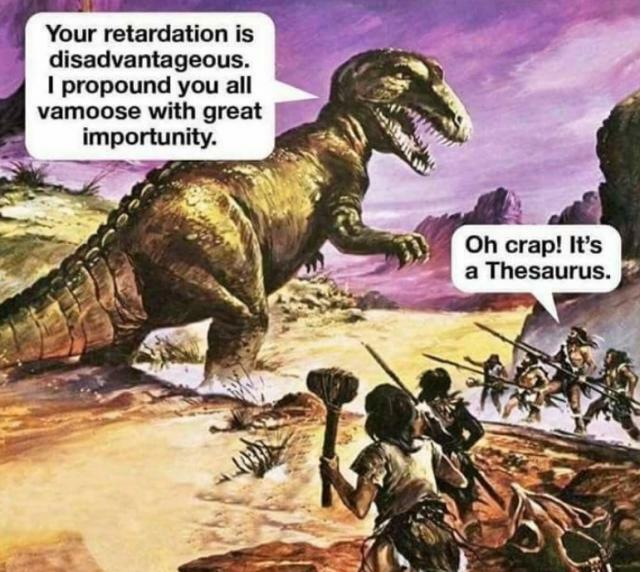 Having a great vocabulary didn’t save the Thesaurus from extinction / eradication / extirpation. Unfortunately, no credit was given. I think it was a drawing that was taken from some creationist literature (creationists think that dinosaurs lived alongside humans) and someone added the text. In searching on the image, I came across it on this site but it does not look it was created there but was submitted to it. But I added a link to it anyway. At that moment, a great gurgling and belching arose from the center of the pond, and a large corduroy monster slowly lifted itself above the surface with a loud hiccup. The company stood rooted to the ground in terror. The creature was about fifty feet tall, with wide lapels, long dangling participles, and a pronounced gazetteer.